Bullying in schools is currently a national epidemic. Research findings suggest that 19 percent of U.S. elementary students are bullied, and each day 160,000 kids stay home from school because they fear being bullied. It’s no wonder parents are concerned! 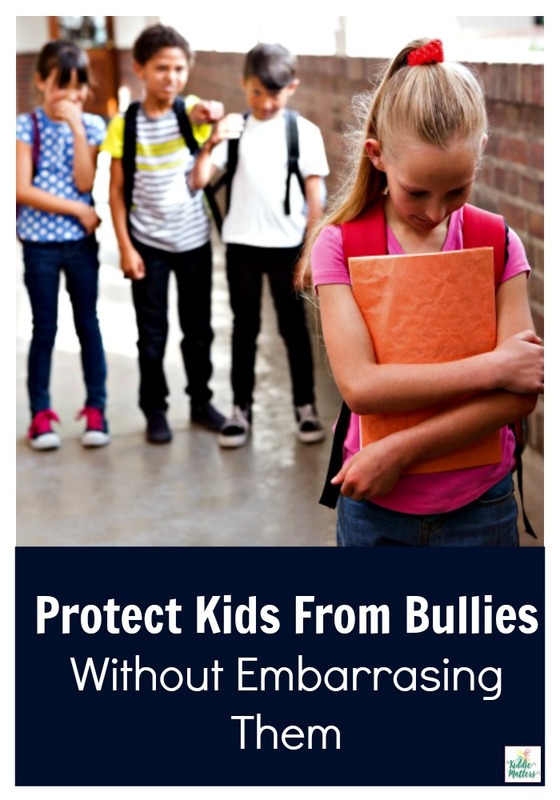 Every day parents send their kids off to school there’s a possibility they will be bullied. They might be bullied for how they look, how they dress, for their academic abilities, or for a disability they have. Some students even get bullied just for being the new kid in class. Although some schools have successfully implemented anti-bullying programs, there are still schools that don’t believe bullying is as big a problem as the research suggests. They continue to wrongfully believe that bullying is just ‘kids being kids.’ Additionally, with more and more kids on social media, bullying can now extend beyond school grounds which intensifies the problem even more. So how can parents protect their children from bullies and the harmful effects of bullying? Below are some steps parents can take to bully proof their children. 1. Create an accepting home environment. When children feel valued at home, they are better able to handle emotional stress and problems with peers. According to Dr. Caitlyn Ryan, director of the Family Acceptance Project, “if kids are bullied, being accepted by their families has a buffering effect, making them less susceptible to negative outcomes [of bullying].” Show your child you accept them for who they are and that they will always have your support and love. Your child will be more likely to confide in you about bullying if they have a positive relationship with you and feel accepted. 2. Be involved in your child’s life. Parents need to take a genuine interest in their children’s lives. Find out what your child likes and dislikes. Who are their friends? What is the current drama in school? (Doesn’t have to involve them). When your kids see that you care about everyday things that happen in their lives, they will feel comfortable confiding in you when bigger issues arise. Bullies thrive on secrecy and if your child doesn’t feel they can confide in you or other trusted adults, they will suffer the harmful effects of bullying in silence. 3. Build your child’s self-esteem and confidence. Bullies like to prey on children that they think are weak and won’t fight back. Parents can’t always be there to protect their children from being singled out by a bully. However, they can equip their children with the skills needed to stand up to bullies by helping their children develop a healthy self-esteem. Parents can boost a child’s self-esteem by encouraging them to participate in activities that make them feel happy and good about themselves. Praising your child’s effort at home and at school will also boost your child’s confidence. Through praise, your child will be able to see themselves in a positive light. 5. Make a plan. Many kids who are bullied suffer in silence because they don’t know what to do. Some kids want to tell on the bully, but are fearful things will get worse if they do. Parents can take the stress off their children by establishing a plan with their child for what to do in the event they are bullied. Having a plan will empower your child because they will know what to do and how to handle a bully. The plan can be as simple as telling your child to ‘buddy up’ with others if they are concerned about bullies. You can also role play a bullying situation with your child to coach them on how to respond to bullies. 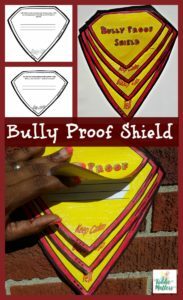 Feel free to download this Bully Proof Shield Flip Book to teach kids some things they can do if they are being bullied. Great post- this topic is of such high interest and importance these days. Schools have a role to play in anti-bullying but parents do also. 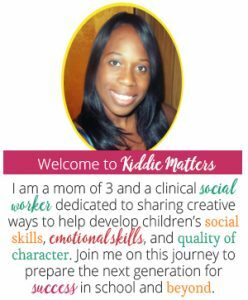 I am sharing on the Education Divas Facebook page. Thank you for a great article and perfect advice! I just want to add that some people get bullied even if they have high self esteem. Some people just to want other people beneath them. But I will take this article to heart and think about it it I get children myself.